Arch Rivals SRK & Salman Khan to reunite again in a YRF movie! Arch Rivals SRK & Salman Khan to reunite again in a YRF movie! 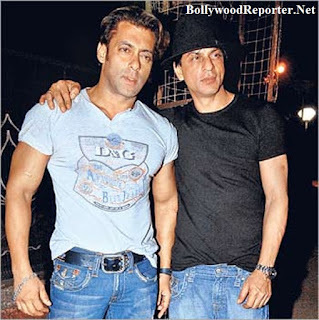 Home > yrf > Arch Rivals SRK & Salman Khan to reunite again in a YRF movie! If the latest rumor is to be believed, than it's a very happy news for all movie lovers! Because this new rumors claim that the jodi of Karan Arjun is to be reunite again with YRF! It would be just awesome to watch both stars sharing one Screen. There is much more rivalry in their fans than themselves. According to sources, Aditya Chopra has succeeded in managing both grand stars and made a decision to direct two Khan's in a movie. Ranveer Singh was being considered earlier in the same film but, Aditya thought if both Khan's work together than they will set Box Office on fire. That's why he signed Salman insted of Ranveer Singh. If we believe sources who are close to YRF, than the film will be Romantic thriller and probably release by end of year 2016. As stated by the source, “The script is ready and both the superstars have liked it. However, the female lead is yet to be finalized. The details will be revealed when Adi decides to make an official announcement. But as of now, both the actors seem enthused about their on-screen reunion.” At this point, it deserves to be mentioned that these two Khans were last seen in the year 2002 in ‘Hum Tumhare Hain Sanam’ and they have not given any comment on the news so far.